Diehard classical music fans know all about the free concerts at New England Conservatory, but a wider public is still discovering this open secret of the local scene. Talented NEC undergrads, graduate students, or faculty offer free performances in Jordan Hall or other spaces, often several times a week. And with conductor Hugh Wolff overseeing the health of the school’s orchestras these days, it was a pleasure to hear the NEC Philharmonia on Tuesday night, with the Taiwanese-born guest conductor Mei-Ann Chen on the podium. I sat up in the balcony, where NEC students were packed in to support their friends on stage. A few young families could also be spotted in the crowd. It was an unusual night for NEC as Chen, an alumna, made an emotional homecoming of sorts, bringing with her a new work by Osvaldo Golijov that she had just premiered with the Memphis Symphony Orchestra, where she serves as music director. The concert began with Dvorak’s “Scherzo Capriccioso,’’ a colorful curtain-raiser here delivered with punch and precision. Chen’s leadership was focused, clear, musical, and in the final minutes, viscerally explosive as she drew real heat and surging energy from these committed young players. 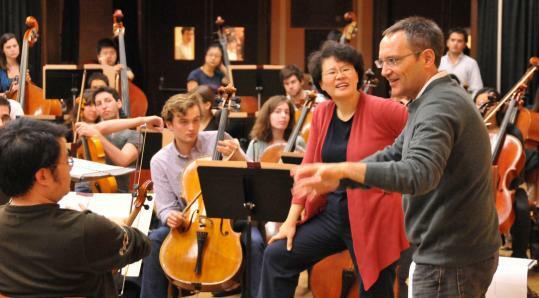 Golijov’s new work, “Sidereus,’’ was commissioned as a way of honoring Henry Fogel, former CEO of the League of American Orchestras, and it is now making its way to 35 orchestras around the country (Tuesday marked its East Coast premiere). Golijov took the work’s name from Galileo’s 1610 book, “Sidereus Nuncius,’’ which contains notes on his first observations of the night skies through a telescope. Golijov, a Boston resident, worked closely with students at rehearsals in recent days, and was in attendance on Tuesday night. For its part, NEC seemed duly proud to be presenting a regional premiere by a prominent composer, so I was surprised to see that Tuesday’s program regrettably contained no notes about this work, beyond bios and the technical details of the commission. The account wedded taut control with an admirable sense of freedom. Chen drew supple phrasing from the strings and woodwinds, and well-pointed contributions from the brasses, but she also sparked some orchestra-wide playing of impressive, scorching intensity. Concertmaster Quan Yuan smoothly dispatched the numerous violin solos. The overall level of the NEC Philharmonia is high but this was not an evening about note-perfect execution. It was instead a demonstration of the singular rewards that can be found in attending performances by students who still play as if they know why they chose music in the first place.